The following 3rd Party Publisher feats are available to a druid character who meets the prerequisites. Druids are proficient with the following weapons: club, dagger, dart, quarterstaff, scimitar, scythe, sickle, shortspear, sling, and spear. They are also proficient with all natural attacks (claw, bite, and so forth) of any form they assume with wild shape (see below). Druids are proficient with light and medium armor but are prohibited from wearing metal armor; thus, they may wear only padded, leather, or hide armor. 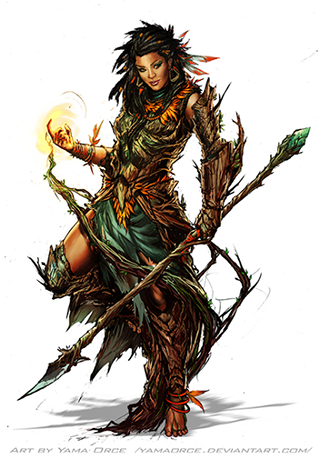 A druid may also wear wooden armor that has been altered by the ironwood spell so that it functions as though it were steel. Druids are proficient with shields (except tower shields) but must use only wooden ones. A druid casts divine spells, which are drawn from the druid spell list. Her alignment may restrict her from casting certain spells opposed to her moral or ethical beliefs; see Chaotic, Evil, Good, and Lawful Spells. A druid must choose and prepare her spells in advance. A druid can channel stored spell energy into summoning spells that she hasn't prepared ahead of time. She can “lose” a prepared spell in order to cast any summon nature's ally spell of the same level or lower. A druid can't cast spells of an alignment opposed to her own or her deity's (if she has one). Spells associated with particular alignments are indicated by the chaos, evil, good, and law descriptors in their spell descriptions. A druid's bonus language options include Sylvan, the language of woodland creatures. This choice is in addition to the bonus languages available to the character because of her race. At 1st level, a druid forms a bond with nature. This bond can take one of two forms. The first is a close tie to the natural world, granting the druid one of the following cleric domains: Air, Animal, Bloodbond (druid must be neutral evil and worship an evil deity), Earth, Fire, Plant, Water, or Weather. Druids also have access to a set of Animal and Terrain Domains. When determining the powers and bonus spells granted by this domain, the druid's effective cleric level is equal to her druid level. A druid that selects this option also receives additional domain spell slots, just like a cleric. She must prepare the spell from her domain in this slot and this spell cannot be used to cast a spell spontaneously. A druid can improve the attitude of an animal. This ability functions just like a Diplomacy check made to improve the attitude of a person. The druid rolls 1d20 and adds her druid level and her Charisma modifier to determine the wild empathy check result. Starting at 4th level, a druid gains a +4 bonus on saving throws against the spell-like and supernatural abilities of fey. This bonus also applies to spells and effects that target plants, such as blight, entangle, spike growth, and warp wood. At 4th level, a druid gains the ability to turn herself into any small or Medium animal and back again once per day. Her options for new forms include all creatures with the animal type. This ability functions like the beast shape I spell, except as noted here. The effect lasts for 1 hour per druid level, or until she changes back. Changing form (to animal or back) is a standard action and doesn't provoke an attack of opportunity. The form chosen must be that of an animal the druid is familiar with. At 6th level, a druid can use wild shape to change into a Large or Tiny animal or a Small elemental. When taking the form of an animal, a druid's wild shape now functions as beast shape II. When taking the form of an elemental, the druid's wild shape functions as elemental body I. At 8th level, a druid can use wild shape to change into a Huge or Diminutive animal, a Medium elemental, or a Small or Medium plant creature. When taking the form of animals, a druid's wild shape now functions as beast shape III. When taking the form of an elemental, the druid's wild shape now functions as elemental body II. When taking the form of a plant creature, the druid's wild shape functions as plant shape I. At 10th level, a druid can use wild shape to change into a Large elemental or a Large plant creature. When taking the form of an elemental, the druid's wild shape now functions as elemental body III. When taking the form of a plant, the druid's wild shape now functions as plant shape II. At 12th level, a druid can use wild shape to change into a Huge elemental or a Huge plant creature. When taking the form of an elemental, the druid's wild shape now functions as elemental body IV. When taking the form of a plant, the druid's wild shape now functions as plant shape III. At 13th level, a druid gains the ability to change her appearance at will, as if using the alter self spell, but only while in her normal form. Instead of receiving an additional skill rank or hit point whenever they gain a level in a favored class, some races have the option of choosing from a number of other bonuses, depending upon their favored classes. The following options are available to the listed race who have druid as their favored class, and unless otherwise stated, the bonus applies each time you select the listed favored class reward. Archetypes are a quick and easy way to specialize characters of a given class, adding fun and flavorful new abilities to already established adventurers. The druid class has several sub-categories of archetypes.